When we think of the milestones, most people think of birthdays, graduation, marriage — significant and recognizable turning points in our lives. This year is all about celebrations on campus. 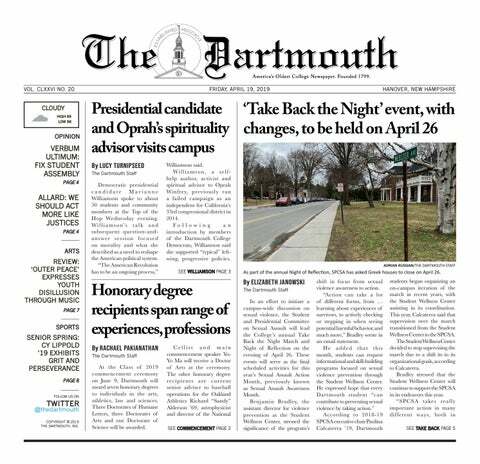 With the 250th anniversary of our college, Dartmouth students and alumni are celebrating an event dear to their hearts. The wildly popular Netflix series on the ways technology can warp our lives, Black Mirror, came out with a new episode, “Bandersnatch,” over winter break. William Shakespeare wrote the words spoken in Juliet’s impassioned monologue centuries ago. The butterfly effect is an idea originating from chaos theory. It states that even the flapping of a butterfly’s soft and small wings can lead to the winds shifting and preventing a terrible storm from happening in another continent. Last year, I spent my fall term as an exchange student at the University of Havana, around the same time that you may have been listening to Camila Cabello’s hit song, “Havana.” Cabello’s lyrics do not lie — I am also left longing to return. I’m a firm believer that astrology is complete nonsense. Still, I’ll admit, there are times when I’ve heard characteristics of an Aquarius, my zodiac sign, and thought to myself, “Oh my God, that’s so me.” The reason I, and so many others, are so susceptible to horoscopes is because we want to believe them.